Teach for America may come to our city — but does it work? Steven Gering, now at Spokane Public Schools, is a TFA alum. Steven Gering thought he was going to be a doctor. But Teach for America changed that. Back in 1993, Gering was in one of the earliest versions of the fledgling national program — intended to recruit a selective crop of college graduates, give them an intense five weeks of teacher training and place them for a two-year stint at urban and rural schools, where they're needed most. Gering says he landed at a school in the Rio Grande Valley, "with over 1,000 freshmen in the second poorest county in the United States." It was one of the fastest growing school districts in the country and had a gang problem. But the experience stuck. 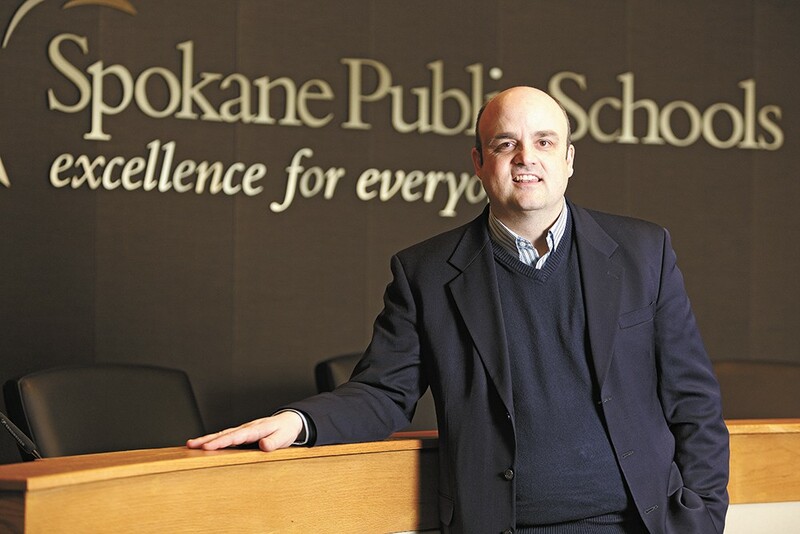 He ditched his doctoral plans, taught there for four years and is now chief academic officer for Spokane Public Schools. "There's probably been no other organization that has done more to take top college graduates and get them into the fields of education," Gering says of Teach for America. Now that organization may be coming to Spokane. Gering confirmed last week that Spokane Public Schools' human resources department has been discussing whether TFA's teachers would be a good fit for the district. While Spokane isn't as high-need as many of the districts TFA serves, Gering says that last year's unprecedented round of hiring has depleted Spokane's applicant pool more than ever before. He also sees an opportunity to add more racial diversity to Spokane's ranks. The decision is still a ways off — it would require district approval, union negotiations and a board vote. And the program is controversial: Despite evidence of the program's success, Teach for America has drawn a chorus of critics, who point to the low retention rate of teachers in the program and complain that it sends teachers into the classroom with far too little training. In Washington state, Teach for America is relatively new but already has weathered its share of troubles. In the first year, one Teach for America teacher was savaged on Seattle blogs and became the subject of a lawsuit over how he got hired. Almost half the Seattle School Board tried to get the district to sever its contract with the agency. On the other hand, eight out of the 10 original TFA teachers in Washington have stayed beyond the program's mandatory two years. Of the Washington state principals who've worked with TFA teachers, a 2013 survey showed 97 percent were satisfied with those teachers' performances. Graduates from local colleges can share firsthand: The program works to prepare some teachers, but has been a total disaster for others. Whitworth University graduate John Williamson says that at one time, getting a job with Teach for America was his "Holy Grail." He had to apply twice, but when he finally got in, he was quickly plunged into an intensive training program in Chicago, where he learned how to teach high school algebra and trigonometry. But Williamson wasn't impressed with the instruction. "Nobody had more than five years of teaching experience," Williamson says. "The training on the classroom management was very limited, completely inadequate." And instead of the high school math classes he'd been trained to teach, Williamson soon found himself teaching second-graders at a charter school in Detroit. It was a nightmare. "I had kids doing backflips, running around on desks, running around with scissors," he says. "I had to physically restrain a kid. I didn't want him to stab other kids." One girl, he says, would pee her pants just to get out of his classroom. Teach for America sent in a few of its team members to help him out, but it didn't help. "They would come and be shocked with the disruption in the classrooms and then give me a few pointers, and 'peace out'," Williamson says. He was fired by November. But TFA quickly sent him back into the field, this time to a public middle-school classroom that had already churned through three other teachers. It was just as bad there. He now runs a blog critical of the program, called "Recovering from Teach for America." Kristina Lusk can empathize with the challenges her Teach for America co-workers have faced. "It's a very unique way of training teachers," Lusk says. "It doesn't always work." A 2011 graduate of Gonzaga, one of the country's top schools for TFA recruitment, she was placed at a school in Charlotte, N.C.
"My first year was not picturesque," Lusk says. "My first quarter was a mess." But when she asked for help, both from TFA and her fellow teachers, she got it in droves. Teach for America even went as far as hooking her up with an earpiece — like a secret agent — and someone to whisper instructions from the back of the classroom. "She could identify explicitly where I was [lacking] in my classroom management piece," Lusk says. "We were able to turn around my classroom quickly." At least one study, commissioned by the U.S. Department of Education, has showed that Teach for America teachers actually do better at teaching middle and high school math than more experienced conventional teachers. In part, credit TFA's selective hiring process: It recruits a crowd of top college students, then hires only a fraction of those applicants.